How Does a Home Improvement Loan Work? | Basildon, Essex. You are here: Home / How does a Home Improvement Loan Work? If you’re looking to remodel your home or undertake a home improvement project, you will need to carefully consider the costs and how you are going to finance the work. A popular option is to opt for a home improvement loan option that can spread the cost of your home improvement costs and put a manageable plan in place to make your dream home a reality. Firstly, you will need to assess what work you want to undertake before selecting the option that best suits you and your home. 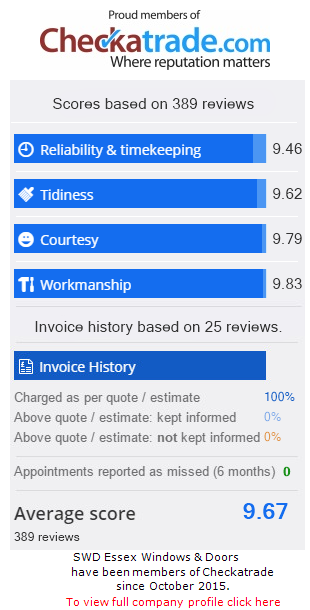 Find out how much double glazing is in Essex or your local area, get a cost and pricing quote, work out how much money you have available upfront, how long the project will take and how much equity you have in your home. SWD Essex Windows and Doors offer a home improvement loan so that you can improve your home now and pay later. Our excellent finance package means that you can get started on your project straight away, paying the home improvement loan back in simple instalments on a monthly basis. We understand that it’s not always feasible to come up with a lump sum upfront. We also understand that spending time saving for your project can be tedious and getting the work completed sooner is a much more attractive solution. A buy now and pay later home improvement loan is perfect for those larger purchases in life such as important property improvements. Paying in monthly instalments makes it easier to manage your money and spread the cost over a period of time instead of settling the payment upfront. We offer 12 months interest free, with helps you spread the payments over a year without the cost of your home improvement increasing. You can benefit from peace of mind when you join our finance scheme, giving you the ability to crack on with your project and enjoy your home updates sooner rather than later. We can create a finance plan that is suited to your budget so that you won’t be entering a repayment plan that’s not reasonable. Our affordable monthly payments allow you to be in control of the term and the interest paid. We are very transparent and won’t surprise you with any hidden fees. We believe that all of our customers should be able to update their home and make their home improvement dreams a reality, which is why we offer products that suit a range of property styles and types at competitive prices. Our flexible payment schedule will allow any homeowner to carry out the home improvement project they’ve always wanted. What could you use your Home Improvement Loan for? SWD Essex Windows and Doors are experts in the home improvement industry. If you are looking to replace or add new windows, doors, conservatories, conservatory roofs or roofline products, we can help. Our range of windows include stunning styles such as the casement window design, French casement, sash windows and tilt and turn. We only use the highest quality uPVC materials to ensure high standards are met with every profile installed. When it comes to door solutions for your home we can assist with uPVC front doors, composite doors, French doors, patio doors, stable doors and bi-fold doors in a range of materials to choose from. If you wanted to use your home improvement loan to extend your home, you should take a look at our range of conservatories from traditional styles such as Victorian and Edwardian to more modern designs such as Lean-To conservatories, P-Shaped and Gable End conservatories. We can also help with conservatory roof replacements, giving your extension a new lease of life and improving the thermal efficiency of your property as well as the aesthetic. We supply and install soffits, fascias and guttering, providing your home with an effective roofline that will make a successful defence against adverse weather and damage. A full replacement service is available making sure any weathered or ageing timber panels are removed and replaced with durable and long-lasting uPVC alternatives. We’ll ensure that your roofline is fitted perfectly so that your home is safe from water ingress and leaking. Your home will maintain its structural integrity and withstand the test of time.